Have I said already how much I love churros with hot chocolate? I first tried them in Barcelona at a Christmas fair. I was standing there on the snowy Gran Via de les Corts Catalanes holding a paper cone of long hot and crispy sugary doughnuts in one hand and a plastic cup of thick dark majic in the other hand... and had no spare hand whatsoever. That is exactly why you do need friends around if you are going for street churros. If you want the churros to be just yours, the best places to have them is one of the tiny chocolaterias. For some reason these are concentrated in Gothic quarter. Sometimes they are specialized in deep fryed pastry. I.e. they make churros(deep fried doughnut sticks or loops) and xuixo (pronounced as "chucho" - deep fried croissants staffed with crema catalana). The two chcolaterias I really liked during my last visit were Granja Viader and Granja Dulcinea. 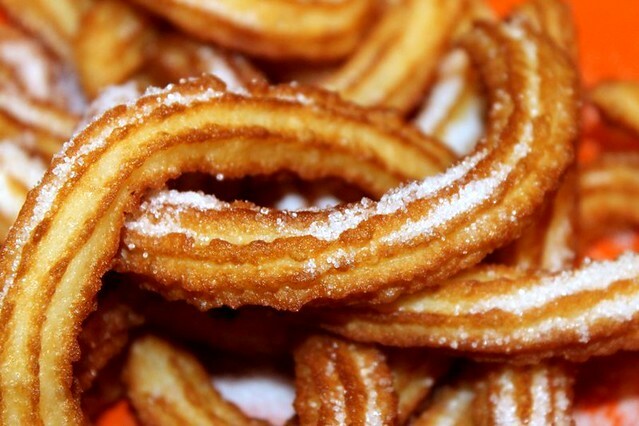 Churros are very different from American doughnuts not only in theirs shape. They are very crispy on the outside. At the same time they do not have any emply space inside - just soft gooey pastry, despite the fact that they are made of choux pastry. It turned out they are truly easy and fun to make. Pastry recipes differ from extremely simple (flour, water and salt) to more sophisticated (including milk, butter or eggs). We tried quite some at our kitchen before we selected the one which yields the churros, closest to what we had in Barcelona. However, you can play with the recipe as well (e.g. with the proportion of milk to water and with the butter content) to select the one you will like the most. One special thing you will need though is a cookie press or a churrera (special press for churros). Ordinary soft pastry bags burst up because the pastry is too firm for them. It is written everywhere. I still tried to use my pastry bag and damaged it. Be wiser then me. Combine water, milk, butter and salt in a medium pan. Set it over low heat and melt the butter. Increase the heat to high and bring to the boil. Take off the heat and add the flour (all at once). Mix with a spatula till you get an even and glossy dough. It will look very lumpy at the beginning, don't worry, it will come smooth in 2-3 minutes. Pour the vegetable oil in a pan. Around 25 diameter is about right. You need the oil to be 2 - 2.5 cm deep. Set the pan over medium high heat and heat the oil. It is ready when a small piece of pastre thrown in instantly floats and gets golden in about 30 seconds. Fill the cookie press or churrera with pastry and pipe out 2 - 3 churros at a time into the oil. The churros need to be around 15 cm long. Normally they are shaped as sticks or loops but life shows that you are likely to try other shapes as well. This is what we ended up with at churro making class at Pinch of Cinnamon club. Fry the churros till they are golden. It is better to flip them over once. 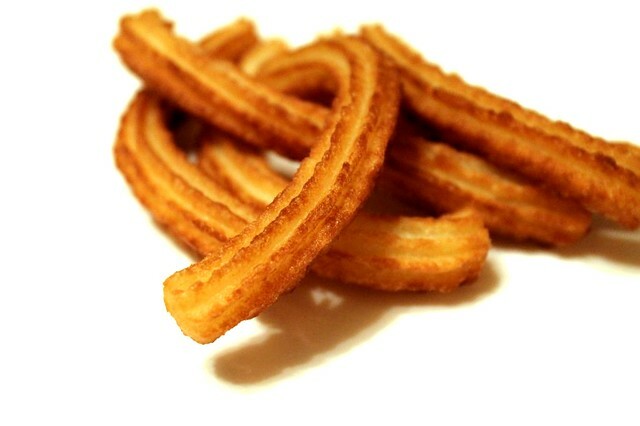 Take the ready churros out on a paper towel to get rid of excess oil. Serve them hot sprinkled with caster sugar. They are perfect on their own, but even better with Spanish hot chocolate. oh, wow, your churros look amazing! !